In the course of the international investigation, "the company was provided with three T-shaped strike elements, which looked like 9M38M1 [model] strike elements, which caused specialists to make their conclusion on the missile type in June," said Almaz Antey’s CEO. Late in July the first full-scale experiment was conducted. Then a BUK 9M38M1 missile and aluminum panels were used. 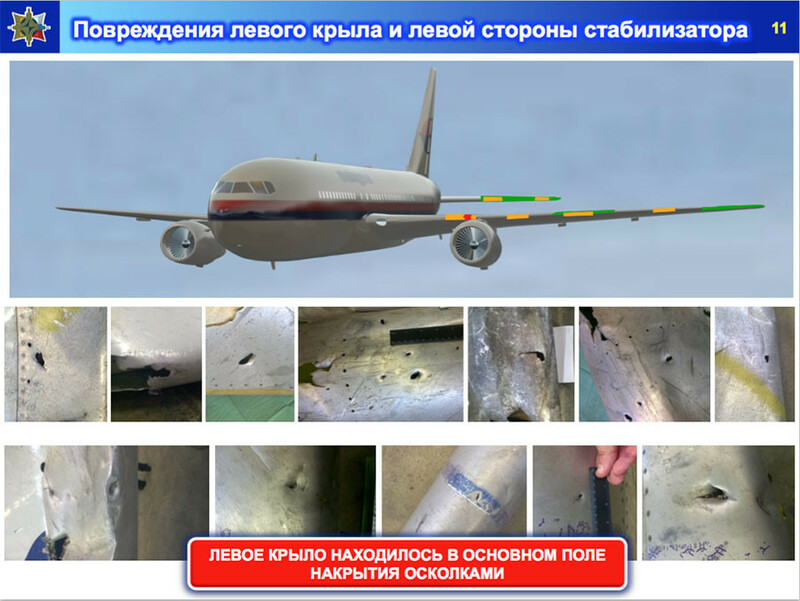 “In the course of the experiment it became absolutely evident that if the Malaysian Boeing was downed by a BUK missile, it was done with an old BUK model which does not have double-T iron strike elements,” CEO Yan Novikov told a media conference in Moscow. The outcome of the experiment was sent over to the Dutch investigators, however, "according to what we know was not taken into consideration," Novikov said. 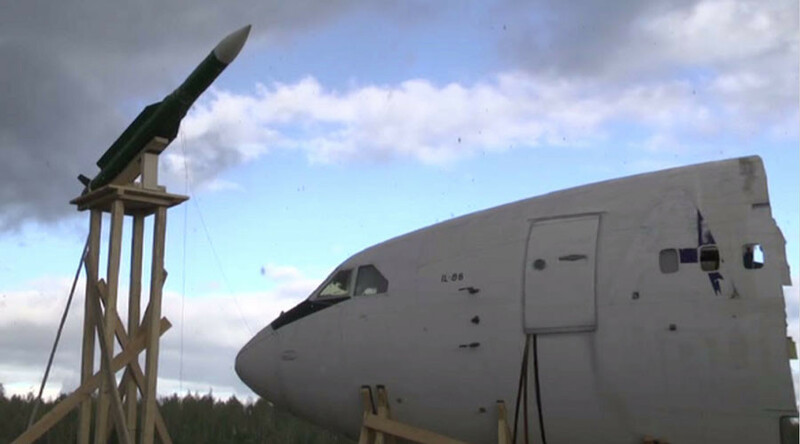 In October, the BUK manufacturer conducted a second full-scale experiment using the missile and a decommissioned Ilyushin Il-86 passenger airliner. The simulation of the attack on the Boeing "unequivocally proved that if the plane was brought down by a BUK system, it was done with an outdated 9M38 missile from the village of Zaroshchenskoye," in Ukrainian military-controlled territory. The company also said that the last missile of this type was produced in the Soviet Union in 1986, that its life span is 25 years including all prolongations, and that all missiles of this type were decommissioned from the Russian Army in 2011. According to Almaz-Antey experts, the Dutch side does not explain why the investigation insists that the possible launch of the surface-to-air missile was executed from the settlement of Snezhnoye, controlled by rebel forces. A missile launched from Snezhnoye could not have inflicted damage to Boeing’s left side and not a single element would have hit the aircraft’s left wing and engine, insist the Almaz-Antey experts. 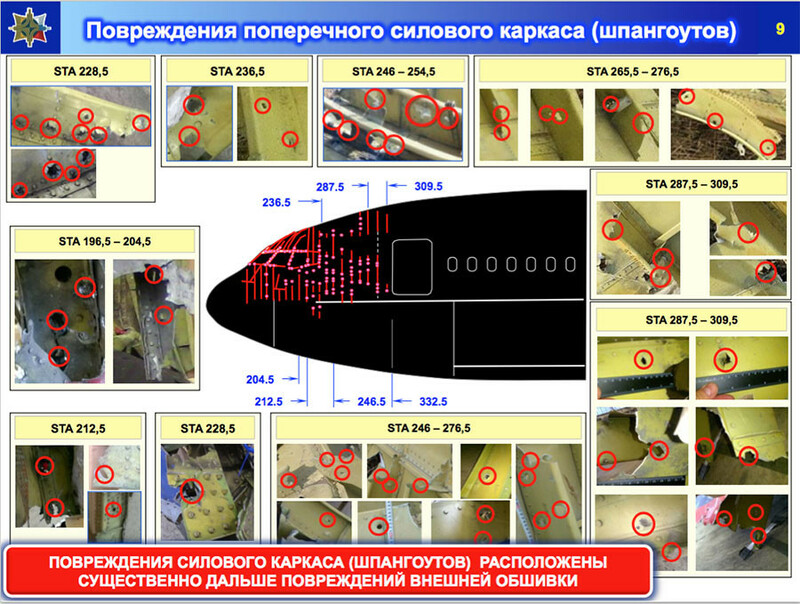 “The main proof that the aircraft was shot down from the direction of Snezhnoye was [the Dutch commission’s] modeling of that process and interpretation of the damage to the fuselage. It does provide a quite visual imagery of how a missile on a head-on course could damage certain areas, yet this kind of modeling does not explain at all the real-incidence angles of striking elements [hitting the aircraft],” Novikov said. 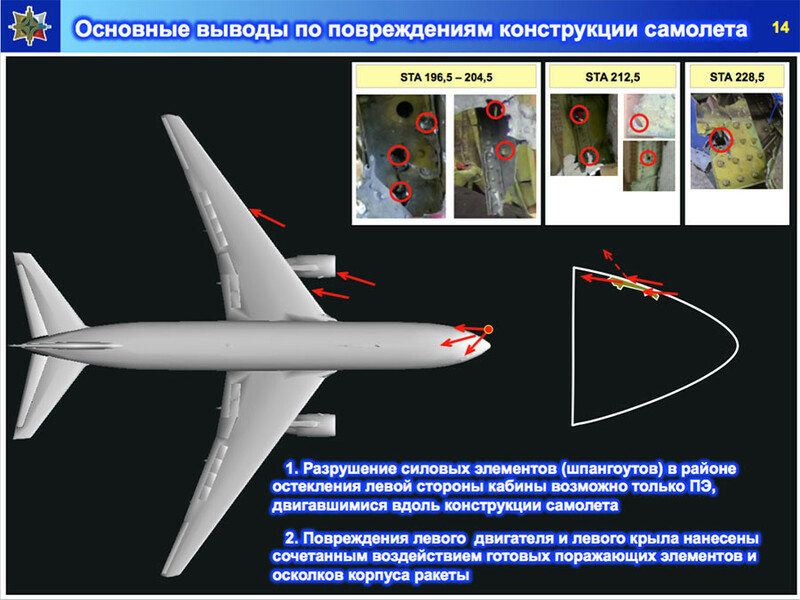 Analysis of the photos of MH17 debris led the company's experts to believe that the blast of the warhead damaged not only the cockpit of the Boeing 777 that crashed in Ukraine, but also the left wing and stabilizer. The detonation of the missile occurred at a distance of more than 20 meters from the left-wing engine and most of the strike elements were moving along the fuselage of the aircraft. “The left wing and stabilizer also bear traces of damage, the size of which provides an opportunity to define them as inflicted by the strike elements of a BUK missile complex,” adviser of the general constructor of Almaz-Antey, Mikhail Malyshevsky, said. 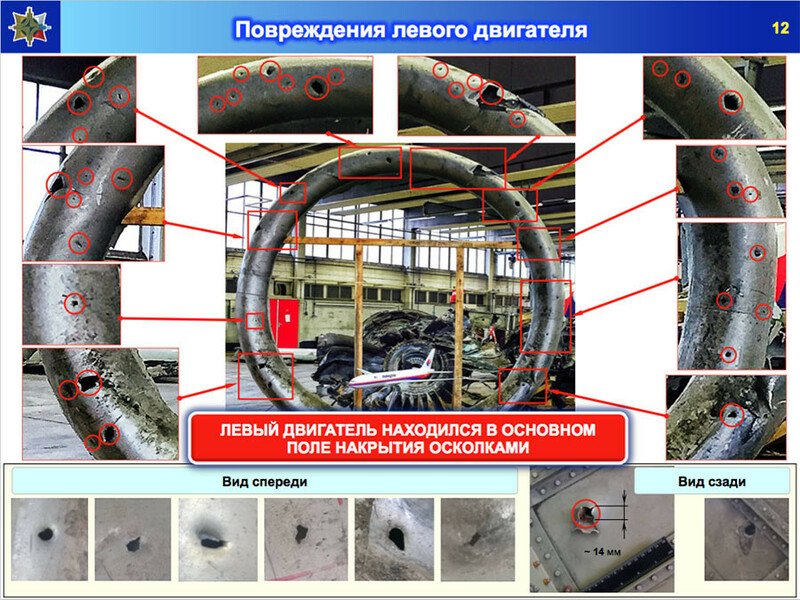 The Almaz-Antey experts paid special attention to the fact that some of the damage registered on the MH17 debris was caused by disruption of the aircraft’s structural components and not by the striking elements of the missile. The experts of Almaz-Antey also said that Ukraine possesses 9M38 missiles, but fell short of accusing either the Kiev authorities or the rebels in the east of Ukraine of causing the catastrophe. The Almaz-Antey specialists have not excluded other possible causes of the MH17 tragedy. 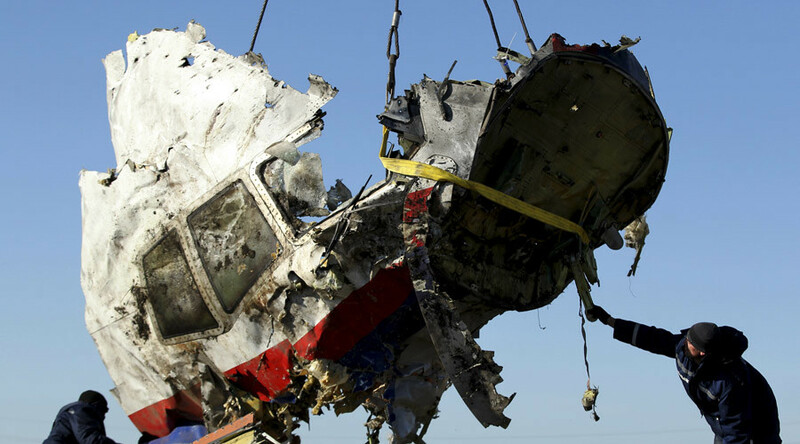 The preliminary theory of the Dutch Safety Board report investigating technical details of the MH17 air crash was presented on June 1 and since then the participants in the investigation, namely Australia, Malaysia, the Netherlands, Russia, the USA, UK and Ukraine have been allowed to deliver their amendments. Russian authorities have repeatedly called attention to the fact that the investigation team rejects evidence presented by Russian entities such as Almaz-Antey, which are not likely to be presented in the final version expected to be delivered on Tuesday, October 13. Simultaneously with the investigation of the Dutch Safety Board, the Dutch prosecutor's office is conducting a separate criminal investigation of its own aimed at establishing the perpetrators of the attack on passenger aircraft. A Malaysia Airlines Boeing-777 flight MH17 passenger aircraft left from Amsterdam to the Malaysian capital of Kuala Lumpur on July 17, 2014. The airliner was shot down and fell to Earth over the Donetsk Region in eastern Ukraine. All 298 people, 283 passengers and 15 crew, on board were killed. There were 80 children among the passengers. Most, 193 people, were Dutch nationals; altogether the airliner was carrying citizens from 10 countries.